Earlier this year, we reported that San Diego's Liberty Call Distilling would be returning to the founders' home town of Coronado for the opening of a new distillery tasting room and restaurant, but plans on that location fell through. 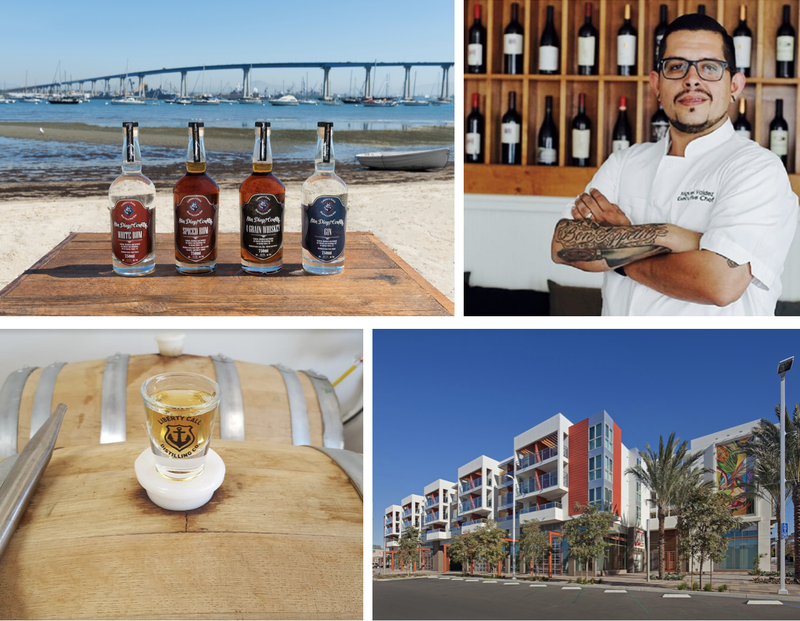 With acclaimed farm-to-table chef Miguel Valdez helming the kitchen, the local craft distillery will now be expanding to Barrio Logan to open its $1 million project. San Diego’s Liberty Call Distilling, which wa founded in 2013, has announced plans for its second location, an expanded concept that will include both a distillery and restaurant with fare from previous The Red Door Executive Chef Miguel Valdez, set to open in Mercado del Barrio at 1985 National Avenue as early as Spring 2019. Liberty Call Distilling Kitchen will encompass nearly 3,000 indoor square feet and a 400-square-foot patio designed by Hurkes Harris Design Associates, who also designed The Local and OB Surf Lodge. An open floor plan with a lounge-like ambience will showcase a working distillery through a glass partition, while Liberty Call Distilling will offer food via counter service and cocktails available from the bar. A large roll-up door will open to a patio featuring high top-style communal dining. Inside and out, Liberty Call Distilling will seat approximately 60 guests. "We really like the energy and vibe that you feel when you walk around Barrio Logan," said Liberty Call Distilling founder Bill Rogers. "It has a cool artistic and industrial feel, with a great Hispanic heritage. Barrio Logan embodies everything San Diegan, and that's something we want to be a part of." Among the future location’s offerings will be Liberty Call’s award winning single malt whiskey, bourbon, gin and white and spiced rum, as well as signature cocktails crafted by head bartender Albert Allison. Small yet diverse lunch and dinner menus will align with what Rogers calls "California tapas: and include dishes like Rum Pickled Strawberry Salad, Smoked Glazed Lamb and a signature Whiskey Burger. Executive Chef Miguel Valdez, who gained acclaim for his farm-to-table fare while at The Red Door in Mission Hills, grew up near the future location and will design the menu and elements of the layout. Arriving simultaneously to this announcement are Liberty Call Distilling’s plans to expand its original and highly successful Spring Valley location by 2,500 square feet, following a lease signed this month, as well as newly hired distiller Mat Brady, formerly at BNS Brewing & Distilling Co. In addition to overseeing spirits, Brady will play a key role in the growth of the distillery’s first location, designing everything from the ground up. "We’ve been trying to find a spot for our expansion for ten months and haven’t been able to find one spot where we could do everything we want to do," added Rogers. "We want a world-class tasting room with food and drinks, and to be able to expand our reach throughout the western United States. The Barrio Logan kitchen will be our tasting room, while our growing Spring Valley space will produce more product. We are investing close to one million dollars within the next year for these two expansions, without having to sell any ownership in the distillery. It’s our most ambitious plan yet, and we feel that we will outgrow both spots not long after they open." For more information about Liberty Call Distilling, visit libertycalldistilling.com.